People just can't seem to follow the standard and my fingers end up raw from taking the stacked connectors apart to re-stack them. And even though PowerPoles have been in use for several years now, people aren't getting the message on how to stack them properly. That's not an issue of the powerpoles, nor TTRAK, nor NTrak. 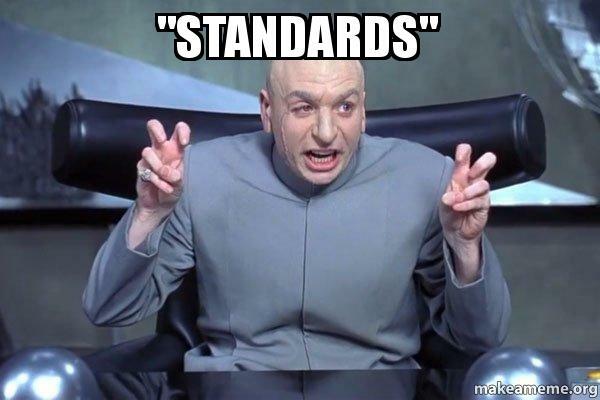 That's an issue of the functionality of your club, and while we all have some sympathy for you personally, most of us don't have much sympathy for an organization that wants to participate in a standards based organizational activity without requiring participants to actually adhere to said standard. Your club is creating the problems you have by not enforcing the standard, engaging in teaching the standard, and, politely, redirecting those who are not willing to comply. Dave Ferrari's Altoona 'pickup' T-trak layout that he organizes is an excellent example of cat herding and he has managed to pull it off even with my stuff in it, and mine is decidedly nonstandard. There's a big mix of stuff there from wires coming off the track into the power bus just with blue and white Kato connectors, to some rather complex-looking multiple plug systems. I got my original supplies from T-kits and got his pre-wired, pre-assembled and coded PowerPole connector plugs so I've gone with that. But to connect it to my home layout, I've had to put additional power plugs in the front, and then set up DPDT's to bridge between the two diverse sources - clearly labeled in the back and made sure that Dave knew what was going on there. And every module I've built runs track connections through a screw terminal strip so that if something is wrong on those powerpoles you can just swap them at the screw end rather than struggle with those plugs. And on my single-track modules I have a DPDT so that you can swap the track between two different powerpole input sources (inner or outer); again the key is that I printed out a label on the backboard as to what that switch does. So far the only time Dave has growled at me is my vertical hump in West Hickory that kept stalling a BLI centipede at the diamonds, I had to fix that. I'm now tinkering with a 'narrow gauge' Nn3 district and trying to figure out how to handle that, as it's really just another accessory, not a module-to-module standard, I'll probably wall-wart it. Maybe. I see that CMR is now selling the right-color powerpole red/yellow/black stuff for Ttrak, but you still have to put them in in the right order yourself. I have a friend that's doing a Ttrak module now and he's coming in from HO, and the first thing we discovered is that he was using the Kato rerailer as the gauge for setting track centers (notches in the side) and I was using the double-track concrete Kato section as the width gauge for track laying, and they are off by the full width of a railhead; i.e. just enough to force a railhead over to create an edge to derail something on. Wait, what? That explains a LOT! I've been using the double track pieces for my gauges now. Do you know which is "right"? Also, I think you need one of these stickers. Our group has many modules, with both types of track, that were measured and set, with both methods. The modules (and track) line 'up' perfectly. What is more likely is that the Kato piece is/was warped, or, after measuring, the track shifted before being secured. But the measurements are the same. We carry a short piece of concrete tie doubletrack to every event that we set up with other club's modules. 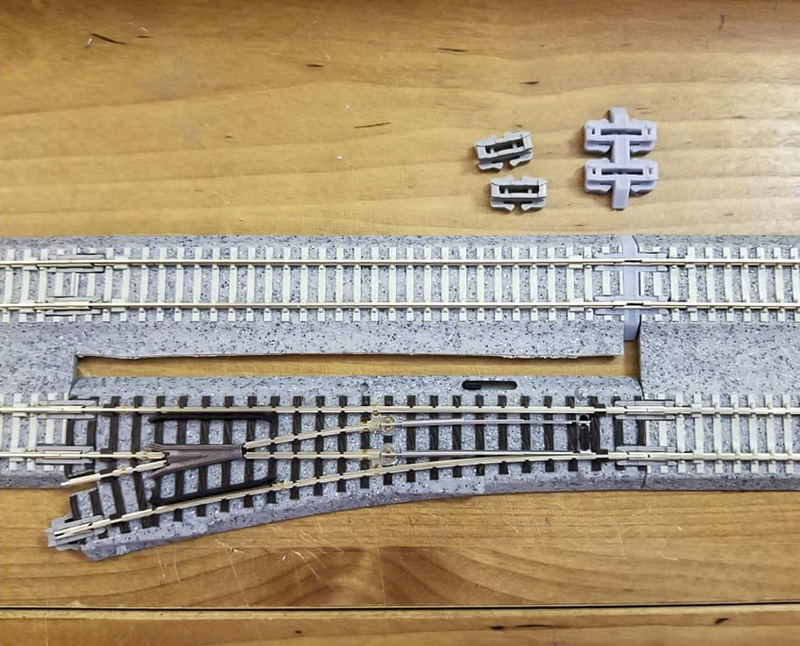 We test the track spacing before adding it to the layout. The spacing is the same and correct, even for all of the modules we've built, using the Kato rerailer as the spacing guide. We've encountered zero issues with derailments due to using both as spacers when laying track. What IS true about the concrete tie doubletrack pieces is that they are just slightly shorter than their wood tie counterparts, creating slightly less 'overhang' on either side of a single module (still within tolerances for a single). where is difference becomes more apparent, and problematic, is on doubles and triples, where the shortage in length is magnified 2 and 3x!. using just concrete tie doubletrack pieces, on a triple, allows zero overhang, and makes connecting the module to another difficult, especially if the modules aren't built to perfect tolerances. the module's track, on the left, was aligned and spaced with the Kato rerailer tool. The track on the left is the Kato concrete tie doubletrack piece. What you're describing are issues with your clubs, then 'blaming' the hardware...that's like blaming the Track being used because a module builder didn't cut it to the correct standard at the ends. Bruce, nobody is blaming the hardware (it is wonderful)! But due to many ways these connectors can be configured, and due to the imperfect human nature, using them is an exercise in frustration. I find it interesting that people screw up the PPs so easily but somehow managed to figure out the Cinch Jones plugs. You're joking Ed. right? Cinch Jones connectors were wick'd easy to use - they were a cinch! They were just like standard appliance plugs in your house: 2-pin polarized male/female connections. Color coded. You can't possibly screw those up, and they were just as easy as the appliance AC plugs to connect and disconnect. Oh how I miss those days . . . If you can get all your club members to adhere to the PowerPole standards the all the power to you - my club cannot. Someone or few always end up with incorrectly assembled connectors. We still have few module sets with Cinch Jones, and those are *ALWAYS* so easy to connect. What IS true about the concrete tie doubletrack pieces is that they are just slightly shorter than their wood tie counterparts. Hey I have a fix for that now! If you can get all your club members to adhere to the PowerPole standards the all the power to you - my club cannot. Someone or few always end up with incorrectly assembled connectors. Are you sure they're not just messing with you Pete? After they're fixed once, that should be it! Unless some people are purposely disassembling and re-assembling them incorrectly at home, just for Pete to fix again at the next show. Sure, sure, it all sounds fine in theory, but in practice it is a huge fail. Sometimes the module owners aren't around when we are hooking the modules up. And then what? Give them a demerit? If we tick them off, they will not show up at the next show (and we always need modules). Bottom line is that it is a losing battle in our club. I guarantee this is your main problem right here. I learned right away with Free-moNebraska; if some people are a pain in the a$$, you're absolutely better off without them. Even if it means scrapping half the layout! The standards are your 'yard stick', if something doesn't measure up, it doesn't go with the layout until its fixed. Period. Yes, it might tick some people off. It sure did here. But then that's a very petty thing to get bend out of shape over too, so that's two headaches you save yourself from! At the end of the day, who's running trains and who's pouting in the corner? This is the second part to the problem. Spending 60 seconds to apply a band-aid versus three minutes to fix it permanently? Oye! There are few things that can not be permanently fixed with generic tools brought to a train show. And if you do require a specialty tool, ask around; some other club might just have one. IS that a 3D printed joiner piece? Nice! As for the Power Poles, no nobody is messing with me, and I;'m not the only one who spends time under the layout hooking things up, and grumbling about the incorrectly assembled power PowerPoles. We can't just scrap showing the layout at a model train event. Not an option. And we can't just eject the disorganzed people because then we won't have a club. You make it sound so easy Mark, to make everything work smoothly and perfectly, but sometimes in real life things just don't work that way. I'm done talking about it since no amount of good-intentioned advice will help me here. All I can say is that nothing is warped that I can see. I haven't measured either with a micrometer though. I always gauge with the double-track piece, everything is fine. I didn't even know the Kato rerailer had spacing notches until we were a bit puzzled over his spacing glitch and he said he was using a rerailer instead of a double-track chunk, so I checked against mine....and went.... huh??? It's not a big deal, but when all else fails, check the obvious. I have more trouble with vertical humps and bumps between my modules. I don't have a gauge or a double track section, so I went with the 33mm standard. I located the tracks on center, then confirmed the alignment by measuring rail head to rail head... I feel pretty good about them, but should I be Lee? I think my mom solves the problem with 9 volt batteries.